GENEVA, SWITZERLAND 34 technically qualified members of the WHO Executive Board is Meeting for its 144th Session on Thursday 24 January 2019. The two weeks meeting will consider a wide range of health issues including the WHO Operation Budget, Global Health Issues and the Implementation of the 2030 Sustainable Development Goals. Fiji is the only Pacific Island Country represented in the Executive Board which provides further leverage for the country to enhance our voice at the global platform. In his opening remarks following the Director General’s opening remarks, Fiji’s Head of Delegation, the Hon Dr Ifereimi Waqainabete, Minister for Health and Medical Services congratulated Dr Tedros Adhanom Ghebreyesus for his leadership and achievements in particular on addressing the Non Communicable Disease (NCD), Nexus between Climate Change and Health and Health Reforms which is a priority for the Pacific. Further he reiterated the need for the Pacific Island Countries health personnel to be equipped with skills and knowledge to enhance their capability to battle this issue thus called on the DG to strengthen WHO’s internship Programme for Pacific countries. Fiji congratulates the DG and the secretariat in its efforts to enhance the fight against NCDs which is a major challenge in our region in the Pacific and is speaking on behalf of the Pacific Island Countries. We would like to call on the DG to maintain the effort on strengthening the internship programme for our young and vibrant health work force. In this regard, Fiji aligns itself to the proposed resolution (A71/B/CONF./1) on Reform of the Global internship programme discussed at the 71st World Health Assembly. We wish to inform that building the capacity of our future leaders in our respective countries and the current reforms on the internship programme, specifically the assistance and support to developing islands nations internship programmes improves equity in knowledge capability and enhances better interaction and access to WHO and its initiatives. Climate change and health nexus is a major concern and the Pacific is a testimony of this emerging dilemma. 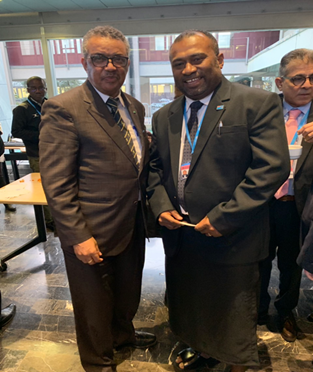 The Hon Dr Waqainabete is accompanied by Dr Eric Rafai and had the opportunity on the margins of the Executive Board Meeting to meet with Senior Executives of WHO including the former and the new WHO Regional Director for the Western Pacific. Fiji is represented in the Executive Board for the first time in the five (5) Western Pacific seat in addition to Australia, China, Japan and Vietnam. This is also Fiji and Vietnam’s third and final year in the Executive Board for its three year term and two new candidates for the Western Pacific is expected to be named for the next cycle. The annual Board meeting is held annually in January where the members agree on the agenda for the World Health Assembly in May and the resolutions to be considered by the Health Assembly. The main functions of the Board are to implement the decisions and policies of the Health Assembly and facilitate its work. The Board meeting will close on Friday 1 February 2019. Previous Post28-01-19 MEDIA STATEMENT: Leptospirosis Outbreak in the Central DivisionNext PostHealth Ministry will further strengthen health services.